Despite inconsistencies, the new Old Oakland restaurant is worth visiting for its first-rate puffy, doughy things. 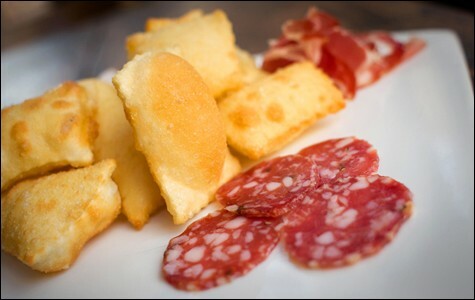 The torta fritta emiliana is clearly the restaurant's best dish. Hours: Mon.-Sat. 7 a.m.-11 p.m. It must have been ten years ago when suddenly even my not-so-health-conscious friends all seemed to be on Atkins or some other low-carb/no-carb diet — everyone ordering their burgers without the bun, trying to stave off that inevitable post-college loss of figure. Carb counters, you'll face no judgment here. But be forewarned: Even more than your typical Italian restaurant, Old Oakland's Borgo Italia poses challenges to those trying to limit their intake. Indeed, all of the most delicious options on the menu are composed, variously, of fried dough, rice, and sweetened cream. Carb upon carb upon carb. No surprise, then, that since the restaurant opened in September, in the former B Restaurant space, Borgo Italia has already gained a following among carb lovers and dessert fiends (two of the key constituents in my reader base, I'm convinced). And those two elements alone make this a place worth visiting, despite the fact that the rest of the menu is hit or miss. A bit of background: Paul Ferrari (of A.G. Ferrari Foods, the retailer of imported Italian foodstuffs) is the most familiar name attached to the project, but in this case Ferrari's prized imports are his partners, general manager Fabio Dalle Vacche and pastry chef Franco Camboli — two honest-to-goodness Italians — who run the day-to-day. What the three partners say they've sought to create in Borgo (which translates to "village") is the kind of unpretentious, decades-old, family-run trattoria that you find everywhere in the Italian countryside. It's the kind of thing every Italian restaurateur talks about, but there's a ring of authenticity here. The decor is old-fashioned without quite crossing over into twee: antique-y light fixtures, red-leather booths, and what appear to be ancient farming implements hanging on the wall. More importantly, just like the true Italian trattorias, the restaurant only offers a small rotating menu: antipasti, pizza, pasta, meat — maybe three or four options in each category on a given night. Dalle Vacche told me the concept here is cucina casalinga, or simple home cooking — not fussy restaurant food. And the secret weapon in the kitchen is an actual Italian grandmother — Dalle Vacche's mother, Luigina, who for years ran her own restaurant in the Emilia-Romagna region of Italy, near Parma, and who flew in to oversee the preparation of her recipes during Borgo's first month of service. During each of our visits our server recommended starting with an order of torta fritta emiliana, and you'd be wise to follow that advice. This specialty of Parma is clearly the restaurant's best dish: ravioli-shaped squares of dough that puff up like proud little pillows when fried — airy as clouds and hollow inside. These came with a spread of sliced-to-order salumi (prosciutto, pancetta, and Genoa salami), and we were told to break these still-warm pockets of bread open and to stuff them with the salumi, like pita wraps in miniature. Turns out this is the perfect vehicle for cured meats — better than dull crostini, better than the finest name-brand bakery bread. I saw a boy, maybe twelve years old, get an order of the torta fritta all for himself. That was his dinner. Smart kid, though the conscience-stricken might tack on a salad or some peperonata (a tasty sautée of colorful bell peppers) to create a semblance of a balanced meal. Borgo Italia is also one of a handful of places in town where you can get a properly cooked risotto — slightly soupy with just the right amount of al dente bite. The risotto al funghi was infused with porcini mushroom stock so intense with umami it was almost intoxicating. Once you get past these standouts, however, the kitchen is hampered by inconsistency. Borgo's pizza, for instance, is done in the Neapolitan thin-crust style, and the first Margherita pie I ordered was as restrained and traditional as any purist could hope for: just bright, clean flavors (a simple tomato sauce, basil, and fresh mozzarella) and a well-charred crust that struck a balance between crunch and chew. But on subsequent visits, the crust was pale and floppy — a shadow of its ideal self. And, while a person without a high salt tolerance would be a fool to order anchovy pizza, Borgo's version was so salty that it blew out my palate; after a couple of bites, even the thick slices of garlic on the pie didn't taste like anything. Meanwhile, a puréed leek-and-potato soup tasted, oddly, only of mushrooms and salt. Basil pesto gnocchi was a bland, slimy mess. Enough dishes suffered from poor execution that I wasn't at all surprised when Dalle Vacche told me one reason for the restaurant's growing pains: His mother, Luigina, went home to Italy a couple weeks ago. Will the kitchen staff regain their mojo without her supervision? Here's to hoping they do. Whatever inconsistencies the dinner menu might suffer, the well-stocked pastry case remains the most reliably delicious reason to pay Borgo Italia a visit. Camboli's signature dessert, the ciambelli, is a staple of his family's pastry shop in Tuscany: a doughnut-like pastry, sliced in half and filled with cream — the sweet puffy-dough ying to the torta fritta's savory yang, if you will. There's also mousse-like panna cotta — rich, intensely eggy, and not too sweet — served unadorned in a glass jar. Even my personal dessert nemesis, tiramisu, was palatable. Borgo's espresso-spiked version wasn't excessively boozy, and Camboli — at least for this batch — had added little nubs of dark chocolate for texture. And the presentation, again in a glass jar, allowed me to embrace tiramisu's characteristic sogginess: Why didn't anyone ever tell me it's more of a parfait than cake? End your meal with any one of these, fellow sweet-tooth possessor, and you'll be hard-pressed not to leave with a smile.